Our customer needed a number of poster display boards, to display an exhibition of timeline photography and documents relating to the history of Belford Hospital. 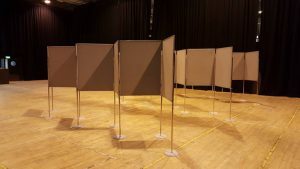 Attended by 500 doctors, the panels needed to be set up in a flexible but attractive walk around system as shown. The panels/ stands needed to be flexbile, capable of displaying posters, and safe and easy for us to assemble in a busy public area, as well as be secure and safe once erected.